The pictures you see on this page are just a sample of many pictures that we have on our database. 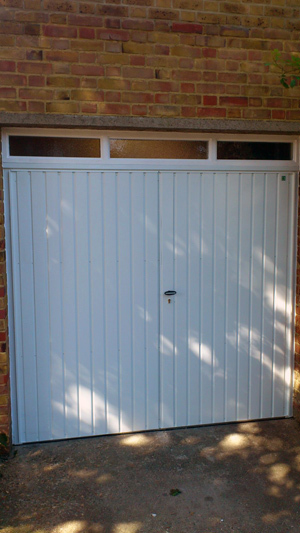 All these pictures are of doors we personally have fitted in and around the London area in the last few years. 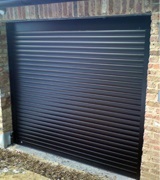 We do not use contractors to install our products. 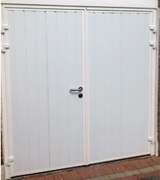 Since we fit all the doors ourselves, this ensures a higher quality of finish and attention to smaller details. 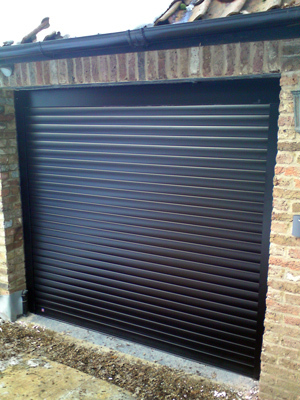 We never allow a situation to arise whereby a tight schedule would lead to the quality of the installation being compromised in some way. 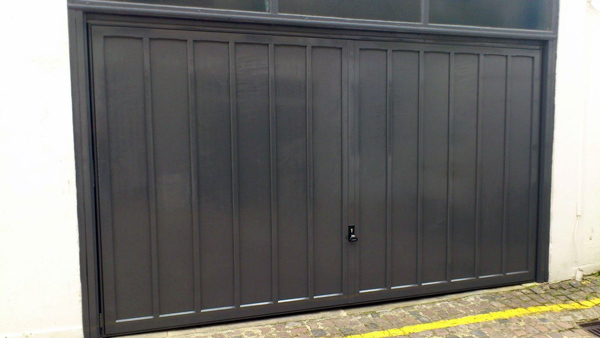 Please click on the pictures for a closer look at the doors. 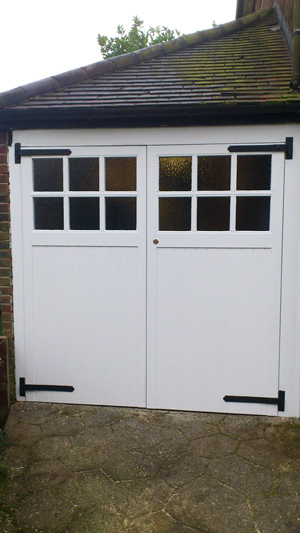 There is text to go along with each door giving a brief explanation of the door type etc. 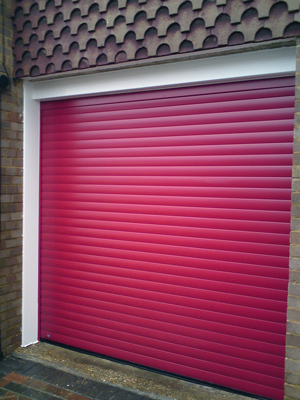 We have tried to have some variety by including pictures of 'Sectional' and 'Roller' doors as well as some basic 'Up and Over' types. Hormann L-ribbed. 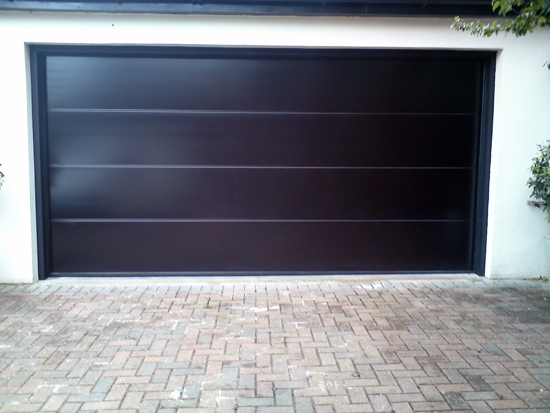 Black Finchley, North West London. Legbud Horizontal - Inexpensive steel, Powder coat Brown finish. East Dulwich, South London. 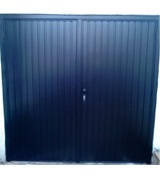 Garador side hinged. Elegant vertical ribbing in Black. Charlton, South East London. Teckentrup Side hinged. 40mm insulation. Lee, South East London. Double skinned and insulated. Large ribbing like this creates a clean modern look. Simple but classic. 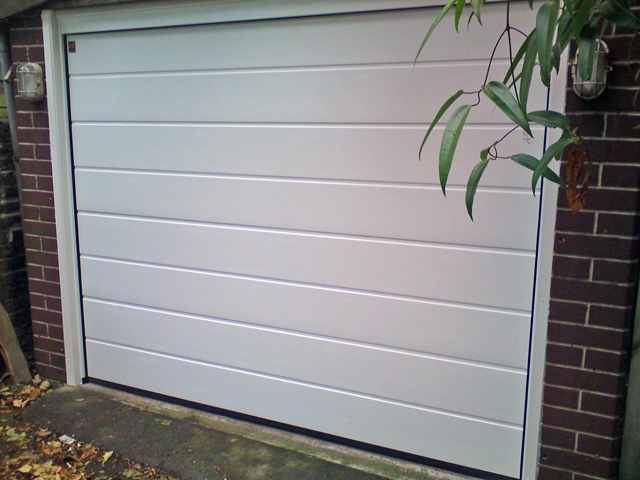 Hormann L-ribbed. Black. Finchley, North West London. Golden Oak. Cross effect windows. 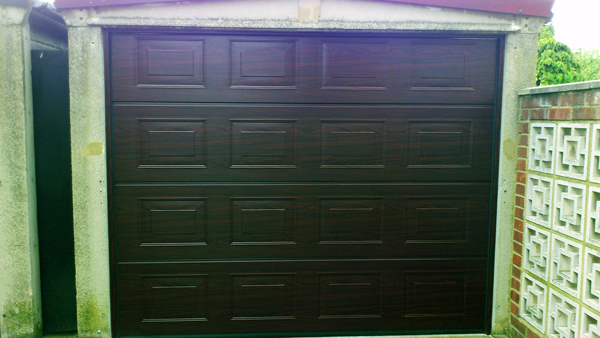 Hormann Georgian. Dulwich, South London. 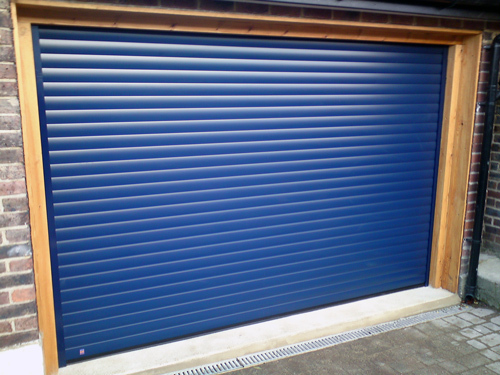 The Hormann range of roller shutters has a number of standard colours at no extra cost, like this dark blue door. Hormann Rollmatic. Catford, South London. 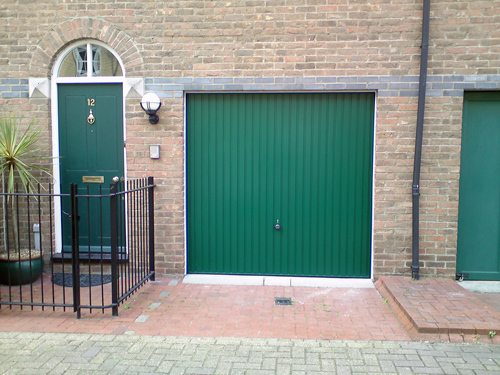 Standard steel Up and Over door. Finished in Green. Garador Framed Horizontal. Kennington, South London. 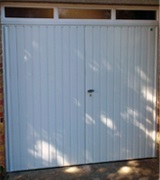 Inexpensive side hinged door by Legbud. Robust. Good security. Hither Green, London. 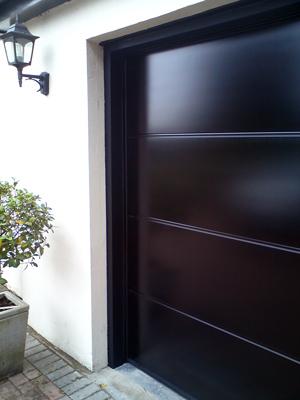 Classic Black Rollmatic door by Hormann. Bromley, South London. 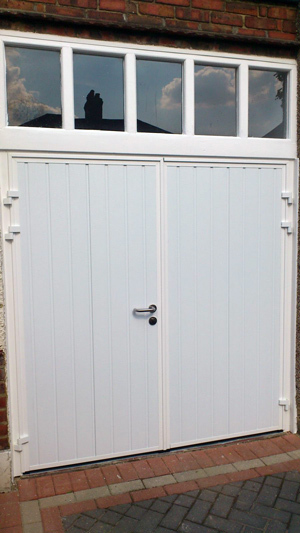 Traditional timber side hung doors. 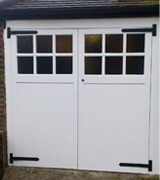 Here we changed the frame, doors, hinges and locks and even managed to match the old fashioned glass. Add a splash of colour. 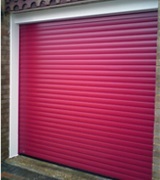 Hormann rollmatic in Red. Sydenham, South London. 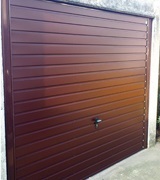 Hormann M-ribbed sectional. 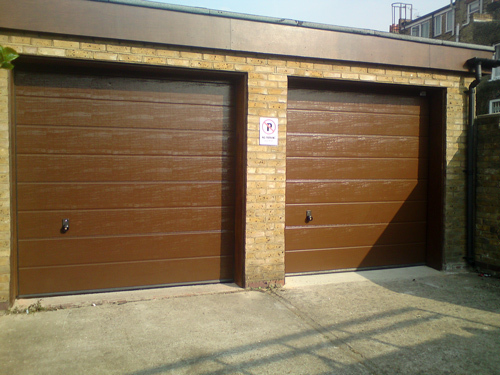 Standard Brown sectional doors. Manual operation. High security locking. Clapham. South London. Garador Seymour Cedar. Elegant old fashioned styling. 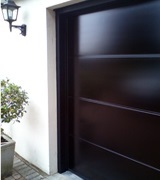 The door was painted to match the existing colour scheme according to local regulations but looks stunning in its natural colouring when stained or varnished. South Kensington, London. 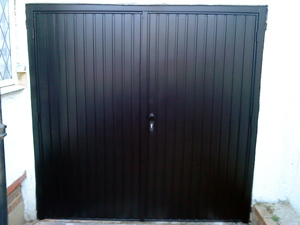 Medium ribbed door. Double skinned and insulated. Clean and modern styling. 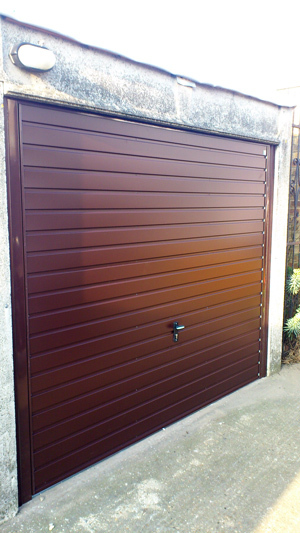 Hormann M-ribbed sectional. Automatic. Chiswick, West London. Hormann Georgian sectional. Double skinned and insulated. 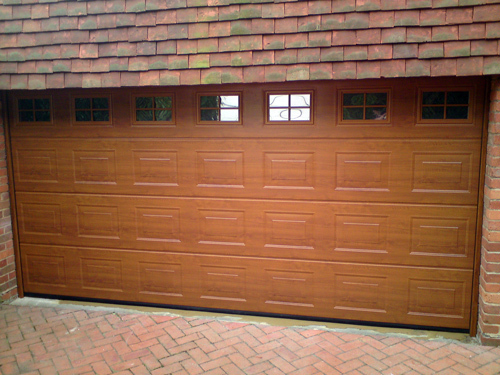 Rosewood finish to match windows etc. Chiselhurst, South East London.